Picture this. 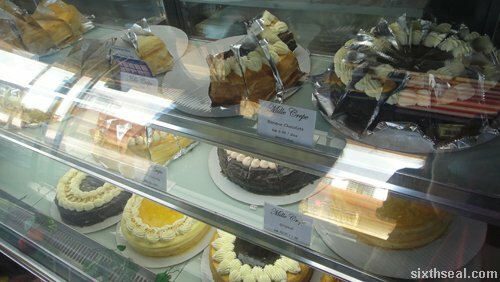 We just arrived in Penang and naturally, one of the things you get in Penang is Tau Sar Pneah (red bean baked pastries). I have no idea why it’s spelled pneah, I would have gone with the shorter phonetic pia. Anyway, that is not the point of this. 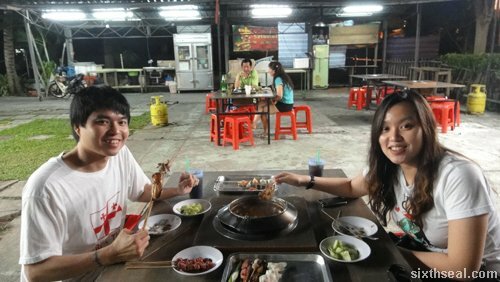 We followed the GPS to Ghee Hiang but when it cheerfully announced that we have arrived at our destination, all we saw was a brick building – with no entrance that the naked eye can see. 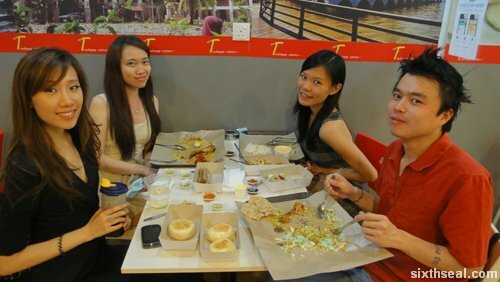 I went there with Cheesie last week for lunch. 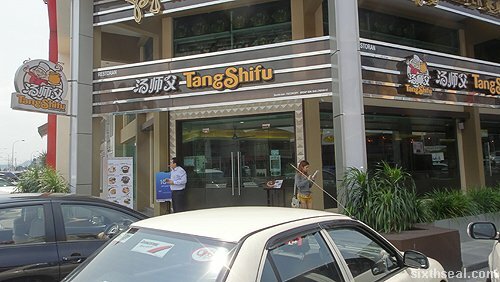 I didn’t feel like eating a huge meal and a place that serves up soup (no, it’s not a soup kitchen) sounds pretty appealing to me so we headed over to Tang Shifu. 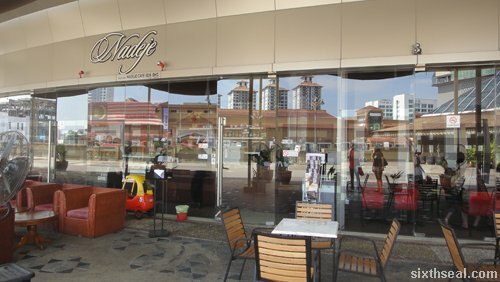 It is actually a franchise with most of it’s branches in Johor but there’s two outlets in the Klang Valley. 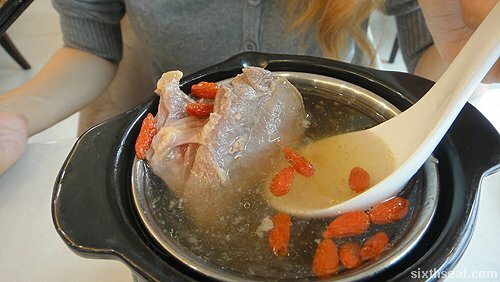 This is supposed to be a souped up version of chicken soup. It claims to replenish blood cells, calms the mind and nourishes the lungs. 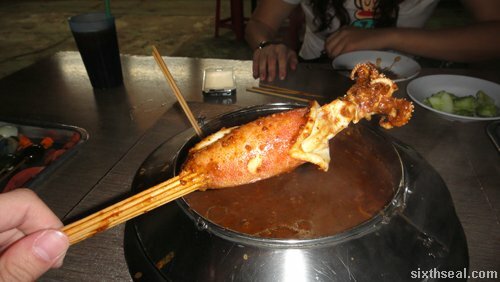 Ringo had this for lunch. 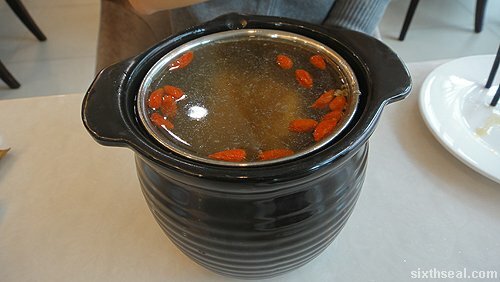 I like how they serve it – it comes in one of those containers you use for Cantonese style double boiling soup. 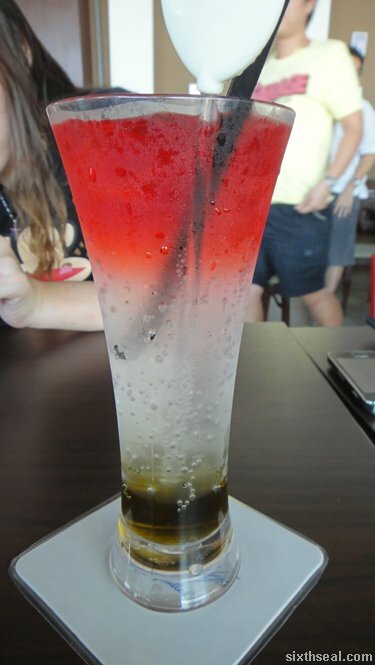 To be honest, I ordered this one coz it looks good in the menu. Heh. 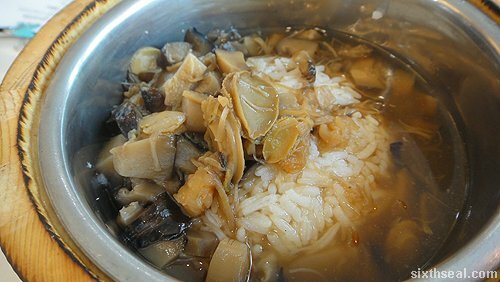 It’s supposed to nourish and strengthen your physique and I like how they mix the steamed rice into the soup. 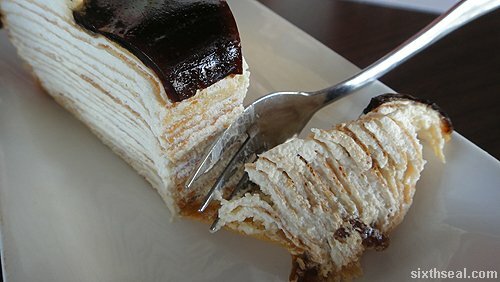 This is Ringo’s dessert – it’s a classic one, and the menu says it revitalizes and moisturizes your skin, calms your mind and regulates breathing. 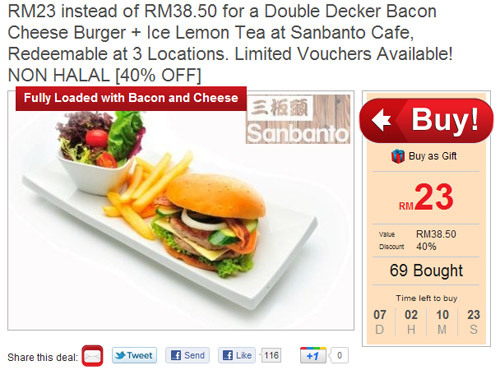 I also went with this coz it looks appealing in the menu. It’s supposed to help with coughs and clear phlegm in addition to relieving heat. I don’t know about that but it tastes pretty good. 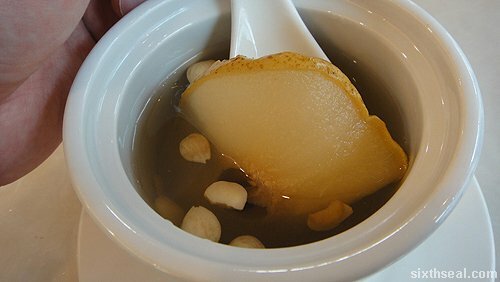 ;) It’s the presentation more than anything – the slice of dried pear with the assortment of other things you’ll usually find in a Chinese herbal shop in a bowl, chilled. 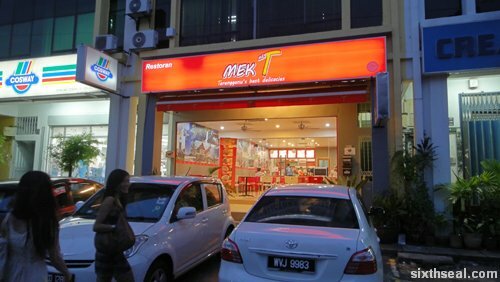 Mek T is a restaurant specializing in Terengganu cuisine opened by Cindy‘s parents. She was kind enough to invite me over for some food so I went with Lainey and Fresh. 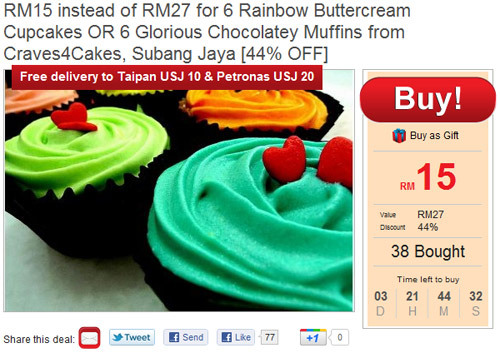 The place is located in Puchong and you can’t miss the signage. 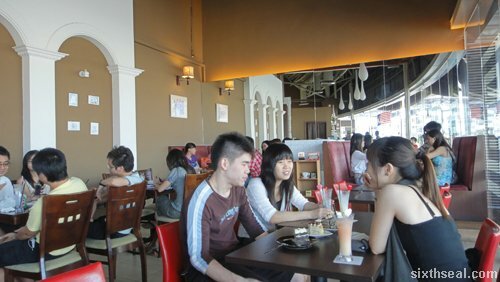 Mek T is based on a quick service restaurant concept – you order reasonably priced a la carte or set dishes at the counter and you wait for the food to come. This is an explosion of colors and flavors. 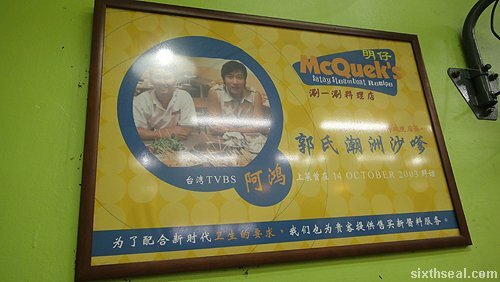 It’s my favorite dish at Mek T, which is surprising when you find out what’s inside it. 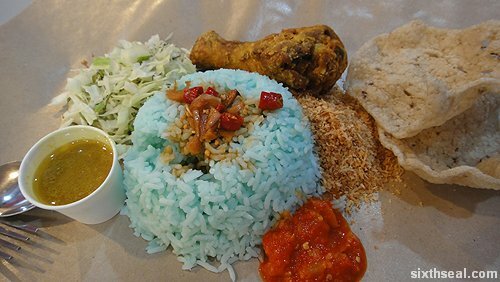 It’s a traditional rice dish that’s blue – the coloring comes from a flower called bunga telang. 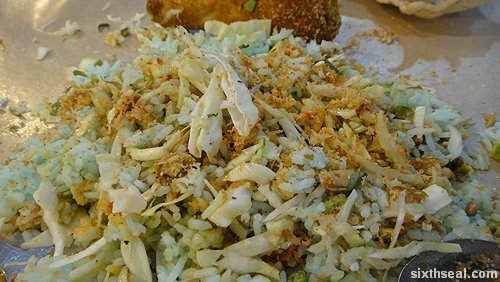 There’s a bunch of raw vegetables and a tiny mountain of brown shredded coconut that you’re supposed to mix into the rice. 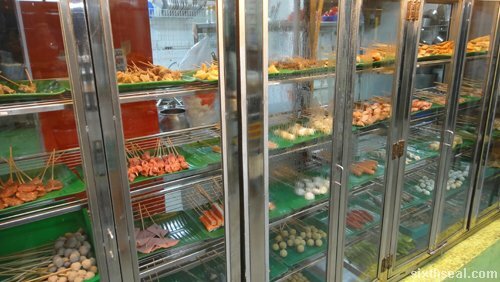 The explosive texture from the raw vegetables, followed by the spiciness of the sambal, with the coconut tickling your palate…it’s a veritable gastronomic orchestra! 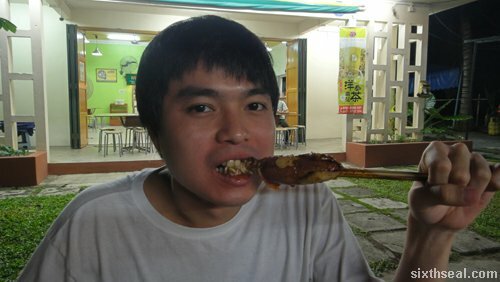 I like the fried chicken drumstick that goes with it too – gotta have some meat with such a vegetable heavy dish. I’m not a huge fan of veggies so this dish really surprised me – it was so good I finished it all! There’s a lot of raw bird eye chilli inside too. I love it! 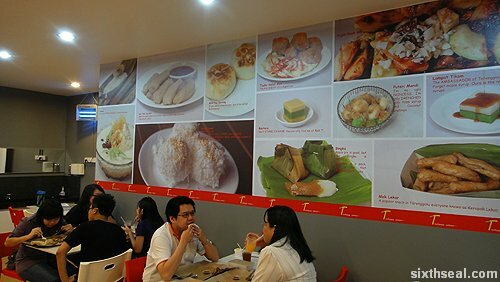 Naturally, keropok lekor has to be in the menu for a proper Terengganu restaurant. 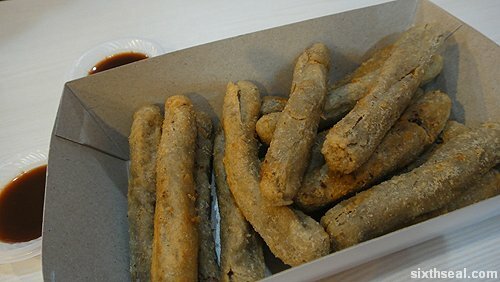 In fact, keropok lekor is in most of the dishes – people in Terengganu eat it with everything, or so it seems. 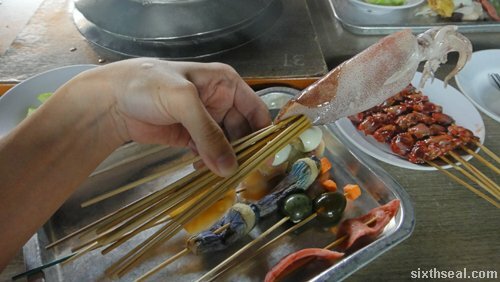 ;) It’s best described as soft fish sausages made from grounded fish paste and sago. 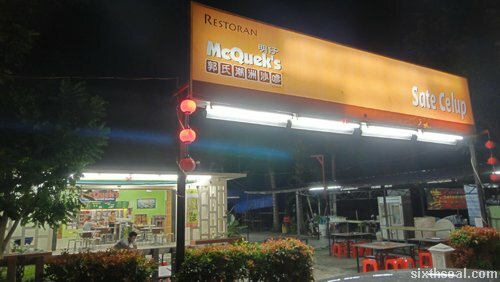 I love Mek T’s version, it’s very fresh. 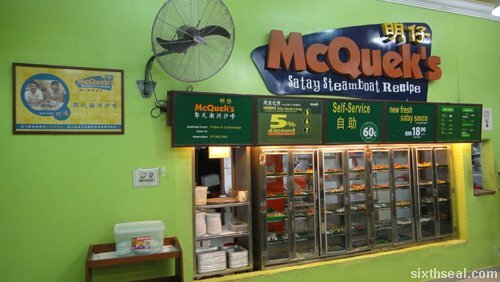 This is described as the most popular meal in Terengganu. 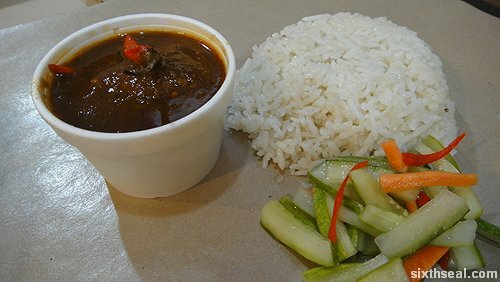 The rice is a mix of long grain and glutenous rice cooked in santan (coconut milk) and it’s served with gulai ikan aiya (curry tuna) and pickled vegetables (acar). 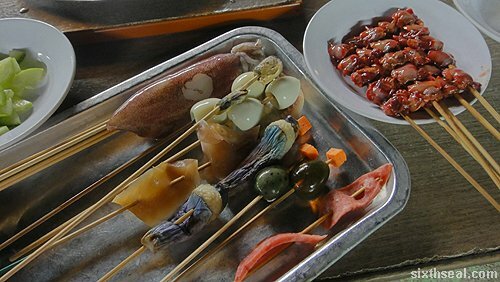 It’s a simple but delicious meal. 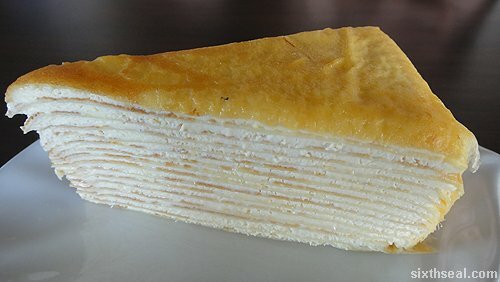 This is Mek T’s signature dish. 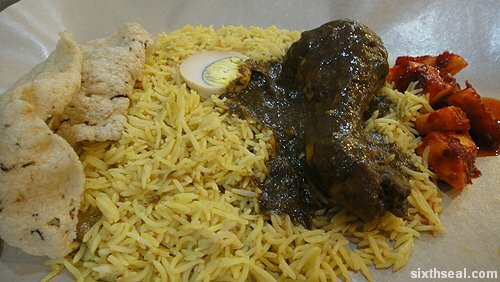 It’s made with basmati rice and served with gulai ayam and an egg. I love the sweet notes in the gulai ayam, I ended up eating most of the drumstick and some of the gravy-infused egg too. There’s also a side of pineapple that goes very well with the basmati rice. It’s traditionally served during special occasions. Great stuff! 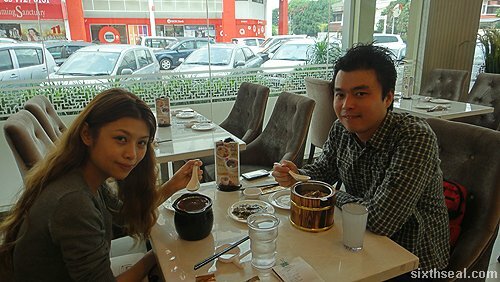 Mek T also does a mean version of laksa too – it tastes really good, with thick noodles. 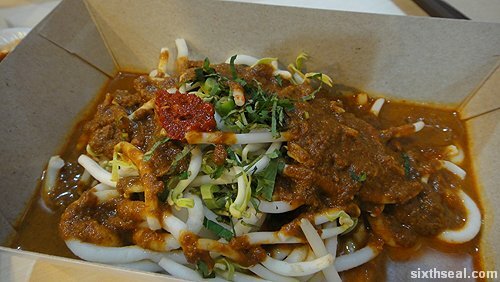 What makes this laksa special is the ulam (raw vegetables) they put into it. 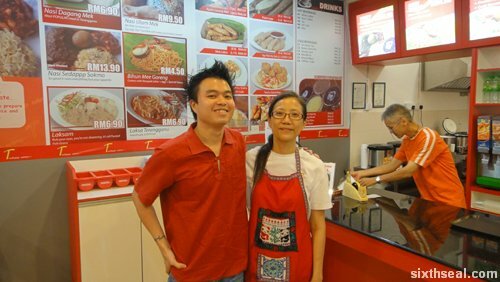 It’s a healthy twist and the laksa tastes different from other variants of laksa too. However, my palate votes for the laksam. 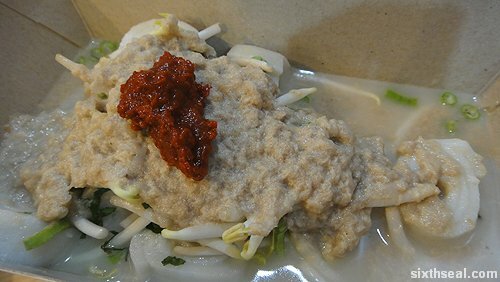 I’ve craved for laksam for a long time and I just can’t seem to find this elusive dish anywhere. 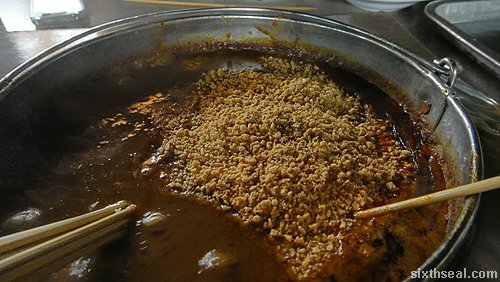 The laksam in Mek T is handmade – rolls of tender wheat and rice flour cut into bite sized pieces and topped with a rich gravy of pureed fish meat. I wouldn’t call it gravy actually, it’s more like fish pieces on top of the laksam. Perfect. 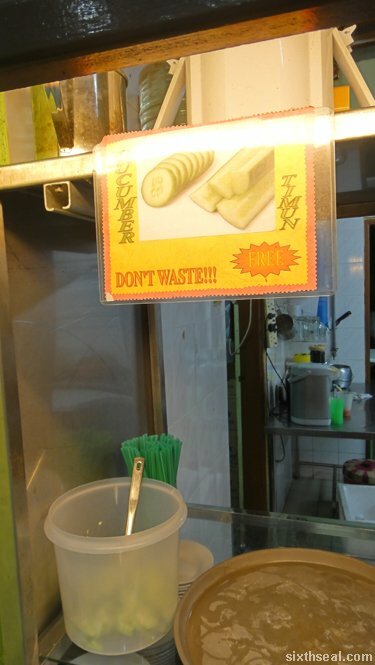 This is a traditional Terengganu kueh served with pure gula melaka syrup. 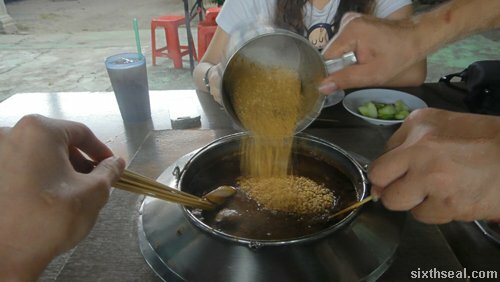 The kueh itself is not sweetened – you get to adjust the level of sugar you want by pouring in the gula melaka. I like mine practically swimming it it. Heh. 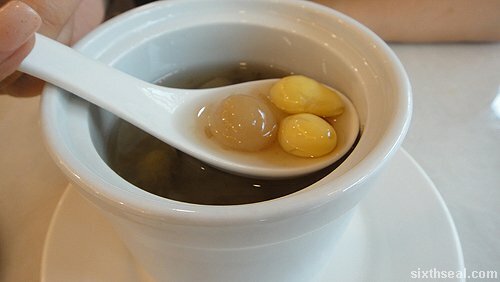 Cindy also gave us some of these to bring back and I wolfed it down right after that heavy dinner – it was that good. 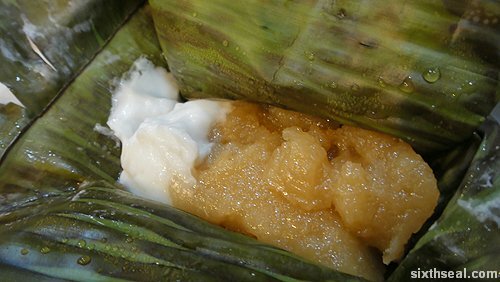 This kueh is made of grated tapioca cooked in gula melaka and topped with coconut cream. 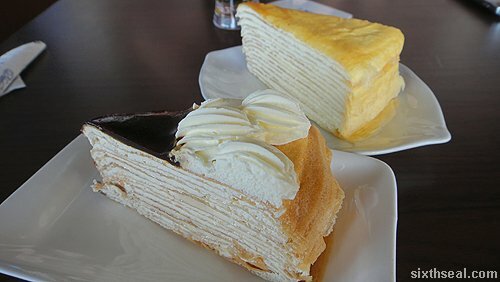 You have to eat them together. 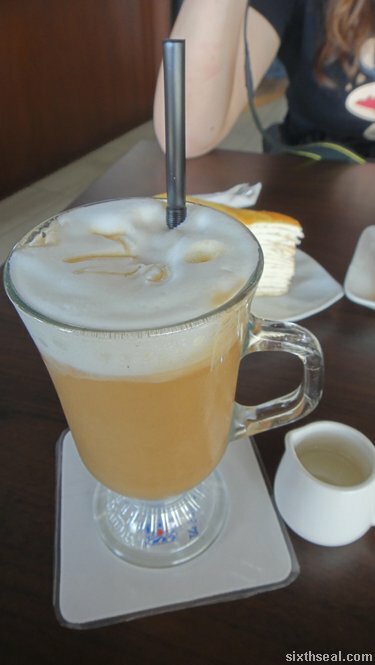 The tapioca with palm sugar is saccharine sweet, with the coconut cream to balance the flavors. 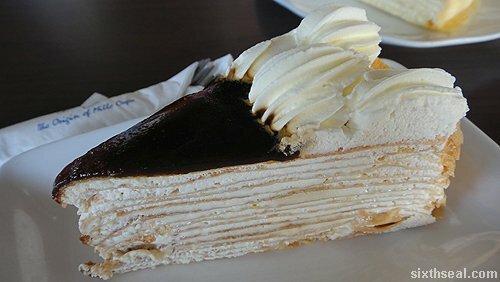 I also finished the ones I brought back home – it’s just so soft and easy to eat! 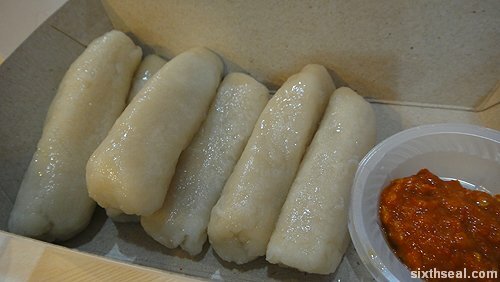 This is one of the undiscovered culinary delights in Mek T. The premise sounds simple – it’s just a fried pau, but the execution is done so well that it has reportedly left people in tears. 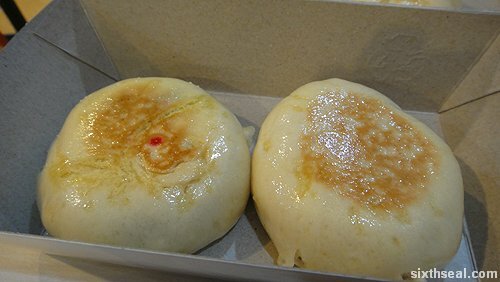 I wouldn’t be surprised, it’s crispy on the outside and warm and fluffy on the inside – a hot bun that comes in coconut or red bean filling. 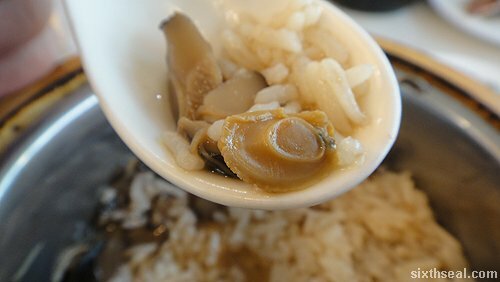 I personally prefer the red bean but either way, you’ve got to try this when you’re in Mek T. It’s amazing how such a simple dish can taste so good. 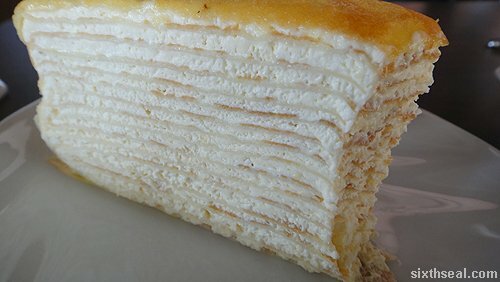 Think of the best fried bread you’ve ever had…except better! 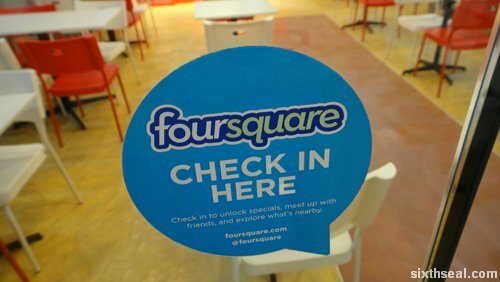 Mek T also has WiFi and you can checkin to their official Foursquare entry to get specials!